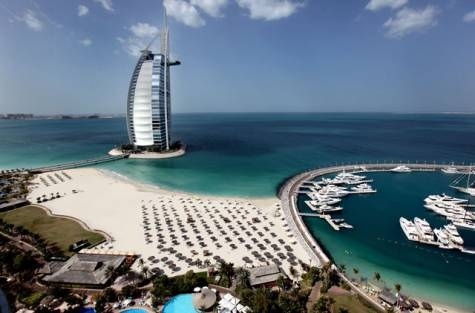 I just saw this photo on the Gulf News – it’s our former beach in Dubai, the Jumeirah Free Beach. It’s pretty different now. The whole arcing marina is new since we were there. And I’m not sure what’s up with the very orderly umbrellas, either. UPDATE: I made a mistake – this is the Jumeirah Beach Hotel beach – closer to the Burj than our free beach. My bad. Weird, I remember the “new” Universal Studios logo for its 75th year.